For the most part, commercial advertisements that appear on a shopping website when you are about to buy something cannot be extremely dangerous. Nevertheless, if it is Buzz-It Ads we are talking about, then you should seriously consider scanning your computer with a licensed antimalware tool, because you are bound to have a list of potentially unwanted programs in your system. It is necessary to remove Buzz-It Ads if you do not want any more adware applications getting installed on the PC. It is important that you remove all the undesirable programs, because it may be a key to your computer’s security. It may seem that there is nothing wrong with Buzz-It Ads, because they appear on shopping websites as pop-ups and other types of advertisements and provide you with various deals that should allow you to purchase your favorite products at an optimal price. However, the fact that we cannot download Buzz-It application (it generates Buzz-It Ads) from the official website at buzz-it.co is highly suspicious. Usually, if we are dealing with a legitimate application, the official homepage should be the main distribution source. Yet, according to our security researchers, Buzz-It cannot be downloaded separately. Therefore, it means that the only way to get Buzz-It Ads installed on the system is via bundled downloads. Since this adware application belongs to Lyrics adware family, it might be bundled with a number of downloaders and installers. You may not even notice that you have installed Buzz-It onto your computer until the ads appear on your screen. Once the installation takes place, Buzz-It launches system services that run in the background of your system. You can find the service via Windows Task Manager on the list of the running system processes. What is more, Buzz-It Ads also install extension on your default browser that collects web browsing history and then generates custom content for the Buzz-It Ads. This content is usually related to what you search online for and consequently it increases the possibility of you clicking the ads. Users are strongly discouraged to click any of the Buzz-It Ads, because you could be redirected to unreliable and even corrupted websites. Needless to say, that Buzz-It does not review all the links that are embedded into the ads, and so you may accidentally find yourself on a website that requires you to fill out an online marketing survey, or you could be offered to install even more adware on your PC. Such things like Buzz-It Ads are not direct computer security threats, but it is strongly recommended to remove Buzz-It and other similar applications from the system, as to ensure that no unwanted applications ever trouble you or your PC. 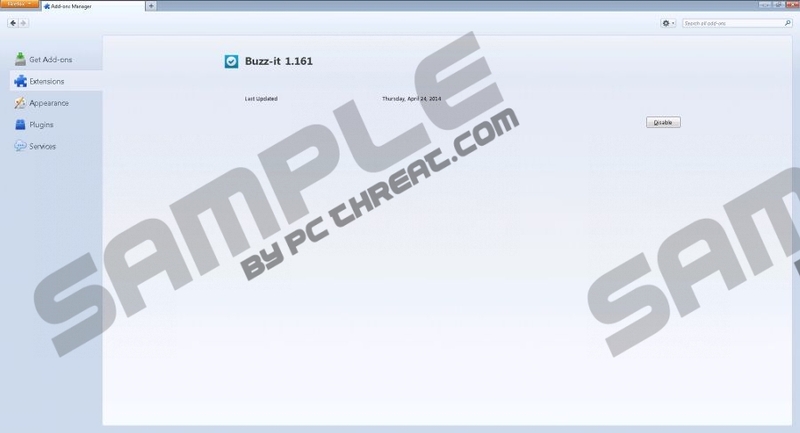 Remove Buzz-It Ads right now and then scan the system with SpyHunter free scanner, because it will help you to determine whether your computer is protected from harm. Go to Control Panel and open Uninstall a program. Highlight Buzz-It and click Uninstall. Go to Uninstall a program and remove Buzz-It. Quick & tested solution for Buzz-It Ads removal.